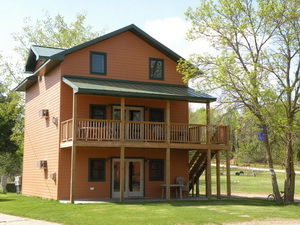 Poplar is a spacious 3 story, 4 bedroom cabin with air conditioning, 3 full bathrooms, two living rooms with 2 fireplaces. 2 satellite TV/DVD players, 2 full kitchens with dishwasher and 2 refrigerators, a whirlpool tub, and a covered deck and patio. From the exterior, it is identical to Willow and Tamarack and the decor and layout inside is almost identical. However, it has one unique feature in that it has two kitchens, one on the 1st level and one on the 2nd level. Perfect for family reunions and friends who want to stay in one cabin together.